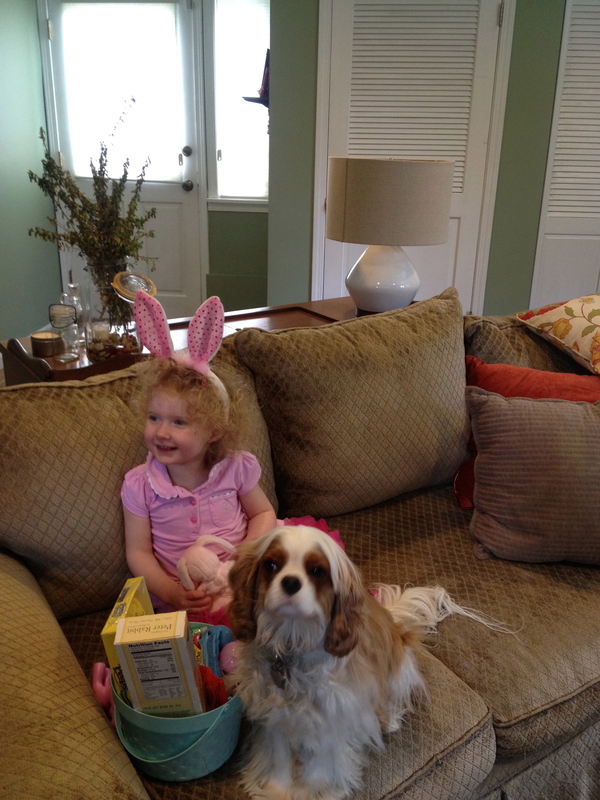 Finnegan and I got to spend Easter with our friends Katie and Julia this year. Finn brought an easter basket, filled with candy of course, so it was a great day for Julia! He also got to play with their pug, Stella, who is just his size. I wish I had another small dog, I think it would be good for Finnegan. And for me! We’ll see if the right opportunity presents itself. . . seems like dogs often find us. I am tired tired tired. I don’t really want to sleep, but I also don’t want to move. If I walk up the stairs and take a load of laundry out of the dryer and drop it on my bed, I have to lay down next to it and rest before I can actually fold it and put it away. It’s very frustrating, actually. But I’ve been able to get out and have coffee with friends and even stop by to see Tara’s newly-painted living rooms. Baby Emerson finally opened her eyes for me! Only for a minute, but it’s a start. Tomorrow I have my second Xgeva shot. It’s not at all a big deal but I am tired of going to the SCCA. I am tired of repeating the spelling of my name and my birthdate a zillion times. It’s not like it’s difficult, I’m just sick of it. But I’ll show up and I’ll spell and I’ll wear my wristband and then I’ll get the heck out of there. I’m going to take the dogs up to Whidbey and hope the sun sticks around long enough that they can have a romp on the beach. Thursday they have appointments at the groomer, I can’t wait for Finnegan to be clean. Jackson is blowing his winter coat and there is dog hair everywhere, so it will be great to have them brush him out. He hates it when I do it, but when Amy the groomer does it he acts like it’s the most wonderful thing ever. He’s such a flirt!